Convey your heartfelt wishes by gifting this Pretty Basket of Exquisite Flowers with Isle Of Style to the people dearest to you. A Tall and Big Basket of Mixed Exotic Flowers and Big Assorted Cadburys Chocolate. 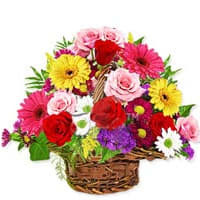 A Tall and Big Basket of Mixed Exotic Flowers with 500 grms Assorted Sweets. A Tall and Big Basket of Mixed Exotic Flowers with 16 pcs Ferrero Rocher chocolate box.